Yesterday we completed our 3rd of the 4 shows we are doing this holiday season and after a very slow start business picked up, which we were happy about that. This time around though I sold only two pens but had a run on peg games. I am going to be making more this week so I have some extra stock for next weekend’s show. The other big switch came in the fact that we sold no crayon rolls this time but my wife took 6 orders for her tailgate checker boards. You can see a few of them here hanging over the front of the table. Not surprisingly in this area the Steelers were the first to go and she got 4 orders for them. 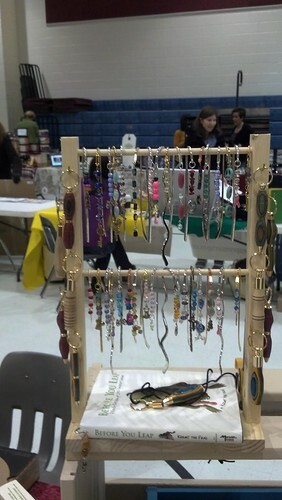 My wife also expanded her selection of metal beaded bookmarks which had shared a tree type display with my mini pens. Since I still wanted them close I needed a new display stand. Here is what I came up with using some wood and hooks I had on hand. Our 4th and last fair of the year is this Saturday and we are again looking forward to it. We are currently discussing a local Spring fair. Has anyone out there done Spring fairs? Any feedback on them good or bad woudl be appreciated. I catch shows all year round. My biggest ones are in January, July and August. But the same rules apply. Think about the type of people that will be going through and tailor product lines to them. I think one problem many vendors have is assuming the same thing works at every location. Best of luck at shows. I hope every LJ sells big that wants to. Spread the word that real wood is real good!